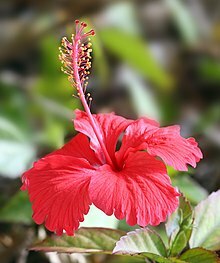 Hibiscus (/hᵻˈbɪskəs/ or /haɪˈbɪskəs/) is a genus o flouerin plants in the mallow faimily, Malvaceae. It is quite lairge, containin several hundred species that are native tae wairm-temperate, subtropical an tropical regions throughoot the warld. Member species are eften notit for thair shawy flouers an are commonly kent simply as hibiscus, or less widely kent as rose mallow. The genus includes baith annual an perennial herbaceous plants, as well as widdy shrubs an smaa trees. The generic name is derived frae the Greek wird ἱβίσκος (hibískos), which wis the name Pedanius Dioscorides (ca. 40–90) gae tae Althaea officinalis. ↑ "Genus: Hibiscus L". Germplasm Resources Information Network. United States Department of Agriculture. 2007-10-05. Retrieved 2010-02-16. This page wis last eeditit on 6 Julie 2013, at 20:07.